As a free museum, the Cleveland Museum of Art (CMA) embraced its mission, “For the Benefit of All the People Forever,” in 1916. Using its internationally respected art collection, the CMA continues to intertwine digital technology and art to enhance the museum experience. ARTLENS Gallery is an immersive digital initiative that includes the ArtLens Exhibition, ArtLens Studio, ArtLens Wall, ArtLens App, and Digital Beacon. 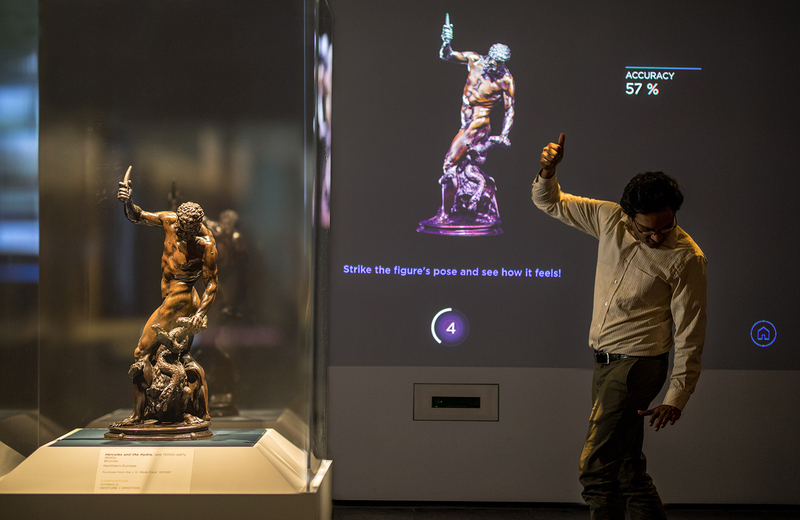 Transitioning away from touchscreen technology the Gallery One relied upon, ARTLENS Gallery uses gesture-sensing projections that respond seamlessly to body movement and facial recognition, allowing visitors to engage with art like never before. ARTLENS Gallery aims to minimize the intimidation of the art museum by providing visitors with basic art knowledge while exploring the CMA’s collection. ArtLens Exhibition features 16 interactives that use motion-sensing, eye-tracking and facial recognition technology. ArtLens Exhibition includes 16 custom interactives giving visitors tool sets to understand an object through composition, gestures and emotion, purpose, and/or symbols using gesture-sensing, eye-tracking, and facial recognition technology. The space includes an installation of 20 art masterworks from across the CMA’s collection that rotate every 18 to 22 months. Visitors approach each artwork and explore the object through two thematic games, ensuring the focus remains on the art. Each individual game can be replayed using hundreds of digitized objects from across the collection. Every interactive ends with the object’s ID, location, and actual size so visitors understand its scale—a feature often missing in digital experiences. All of ArtLens Exhibition’s digital experiences pull its content from a unified back end platform composed of a collection catalogue management and digital asset management system. Along with custom-designed web tools, this back end system allows the CMA to update the ArtLens Exhibition experience at any time by adding more content, artwork, and games without relying on outside resources. Bluetooth integration enables photos captured during gameplay to save directly to an iOS or Android device’s camera roll. ArtLens App seamlessly connects the ARTLENS Gallery experience and features an interactive map using 240+ iBeacons throughout every gallery, personalized tours, high-definition images, and object information about every work on view. Bluetooth integration allows photos captured during game play to save directly to a device’s camera roll. All artworks played at the interactives or favorited at the ArtLens Wall are saved to the app’s “You” feature for further exploration. Using innovative image-recognition software, the app seamlessly recognizes a selection of two-dimensional artworks and provides additional curatorial and interpretive content with the scan feature. If an artwork is scannable, the scan icon will appear next to the artwork in the gallery and on the artwork’s description in ArtLens App. Visitors can click on important symbols highlighted directly on the screen to learn more. Each month, more artworks are made scannable so there is always more to explore and learn. In the app’s search bar, visitors can find “Top 10 Visitor Highlights” and “Collection Highlights” in addition to images of all works of art on view with interpretive content. Visitors use their bodies as magnifying glasses to look closely at details of an artwork in the ArtLens Studio interactive, Zoom. 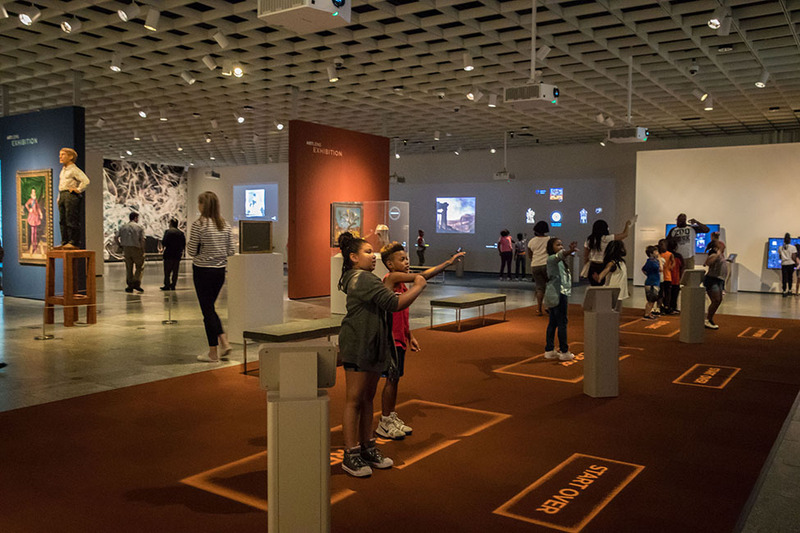 ArtLens Studio, the prototype for removing touchscreens, provides a unique introduction to the museum’s collection by using gesture-based technology for visitors to start their relationship with the collection. Visitors can create their own digital works of art in four play areas. Live visitor-created content featured on the digital Beacon is pulled from ArtLens Studio and ArtLens Exhibition. The Digital Beacon, located at the entrance, is a 20-foot screen that pulls live visitor creations from the ArtLens Studio, ArtLens Exhibition, ArtLens Wall, and ArtLens App and features works of art on view from across the collection. Though the outward experience is more engaging than ever, the impressive work that will make ARTLENS Gallery scalable and sustainable is a significant upgrade to the backend platform. The CMA established a standardized, well-documented development environment, including: a master application programming interface used for integrating all artwork, artist/creator, and location information, a common framework for defining and testing the content structure and staff workbenches needed to manage both existing and new interactives, a consolidated content delivery network platform for digital assets for all interactives (in ArtLens app, exhibitions, collections online, or any future interactive) for ease of management and troubleshooting, and a single method for connecting interactives to user devices for favorites and saving of user-generated content. The CMA’s custom-built catalog management system pulls live content, writes it once, and then updates it everywhere, making any artwork information or interpretive content updated by the curatorial, registrar, or interpretation departments immediately accessible in all digital interactives. Art is always in the foreground in the ARTLENS Gallery experience. The Composition theme exposes visitors to artists’ compositional choices that influence the experience of looking at art. The four games under this theme involve geometric, multi-focus, and all-over compositions to demonstrate the different ways artists purposefully create their art. • Shape Seeker: Visitors reveal underlying geometric shapes in an artwork to understand the arrangement of elements. • View Finder: Visitors explore an artwork to find its multiple focal points, allowing them to notice how the different elements in the fore, middle, and background interact with each other. • Become an Artist: Visitors create an original artwork based on the color, composition, or pattern of an artwork with no central focal point. • Become an Artwork: Using an artwork as inspiration, visitors are transformed into a unique all-over composition or create their own geometric pattern with their body. The three games under the symbols theme allow visitors to explore the meaning behind secular, religious, and personal symbols artists embed in their artwork. • Hidden Meaning: Visitors scan a work of art with their hands to reveal the meanings of hidden symbols encoded in an artwork. • Symbol Sleuth: Using contextual clues, visitors guess which symbol in an artwork represents a specific theme. • Decode Symbols: Visitors analyze an artwork with missing symbols and select the correct symbol from a list that completes the artwork. Gestures and Emotion allow visitors to explore the different ways artist convey a narrative through body language and the emotions they hold. 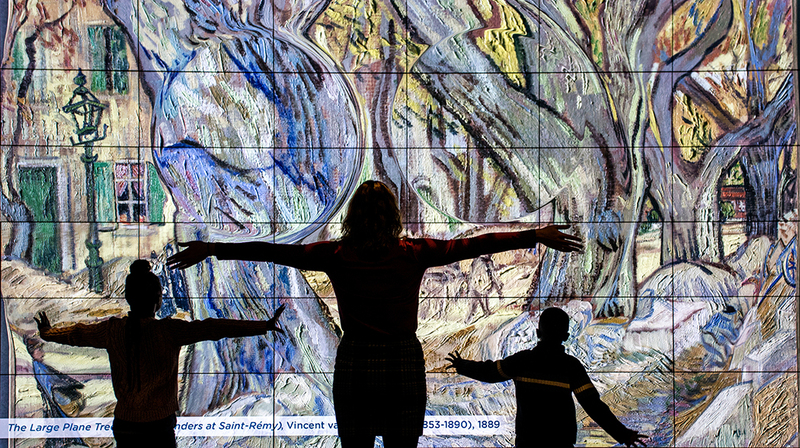 These interactives empower visitors to understand how expression and movement can change an artwork’s meaning. • Mashup: Visitors reinterpret portraits with their own expressions to experiment with how emotions can impact the meaning of an artwork. • Make a Face: Visitors show how they represent an emotion depicted in an artwork and their expression is matched with an artwork in the CMA’s collection. • Body Language: Visitors look closely at highlighted figures in an artwork and match a pose with an identified emotion. • Strike a Pose: Visitors mirror the pose of a figure(s) in an artwork to more deeply understand its meaning. The three purpose interactives decode the function of artworks by investigating, what, how, and why objects were used in their original context. Visitors learn to distinguish between the functional, decorative, and symbolic roles artworks possessed. • Purpose Discovery: Visitors place an unfamiliar object on different parts of the body to discover its original use. • What Am I: Visitors guess the modern equivalent of an object from a range of options. • Dress Me Up: Wearable objects are available for visitors to virtually try on. In addition to the 14 projection interactives featured in ArtLens Exhibition, there are two unique, independent interactives that allow visitors to engage with artwork from the CMA’s collection in other ways. Visitors virtually try on an object from the Cleveland Museum of Art’s collection in the ArtLens Exhibition game, Dress Me Up. Gaze Tracker uses advanced eye-tracking technology to show the path your eyes take while looking at an artwork. At Gaze Tracker, visitors sit in front of a monitor, wait for the interactive to calibrate with their eyes, and look at a piece of art for 15 seconds. On a video projection, the interactive shows visitors the details they viewed first and for the longest amount of time. With this information, visitors can compare their results with others saved to the game. 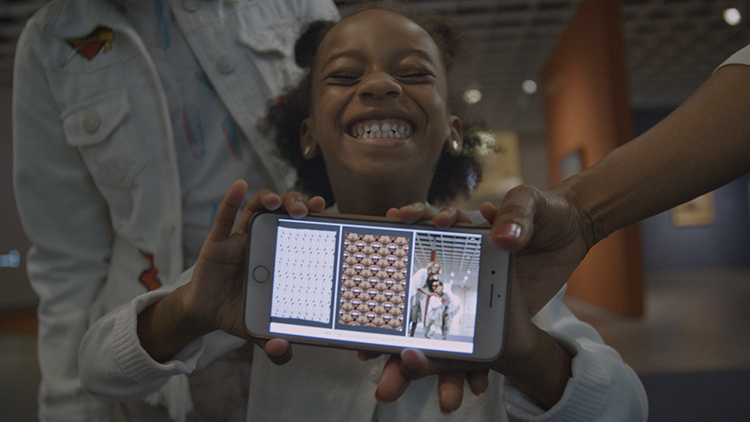 Visitors spend 30 seconds reacting to artwork from across the museum’s collection and facial-recognition software sorts the responses into emotions such as happiness, surprise, confusion, distaste, fear, and sadness. 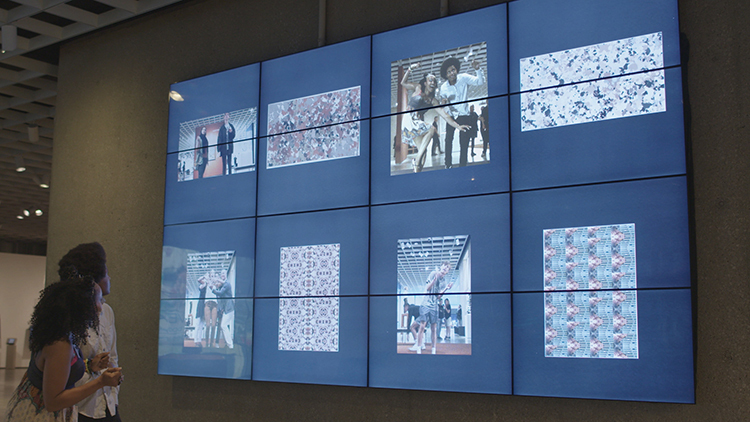 After reacting to the artwork, visitors can save a video directly to a device’s camera roll via Bluetooth technology and select a mission to launch them into the galleries. 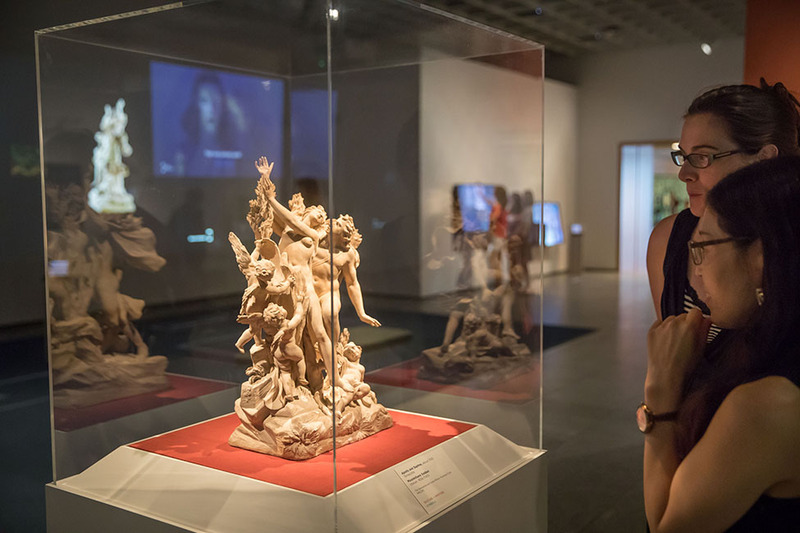 Visitors can see 20 masterworks of art from across the Cleveland Museum of Art’s collection in ArtLens Exhibition and recognize their projected 3D images in the space as an invitation to engage and learn more about an object. 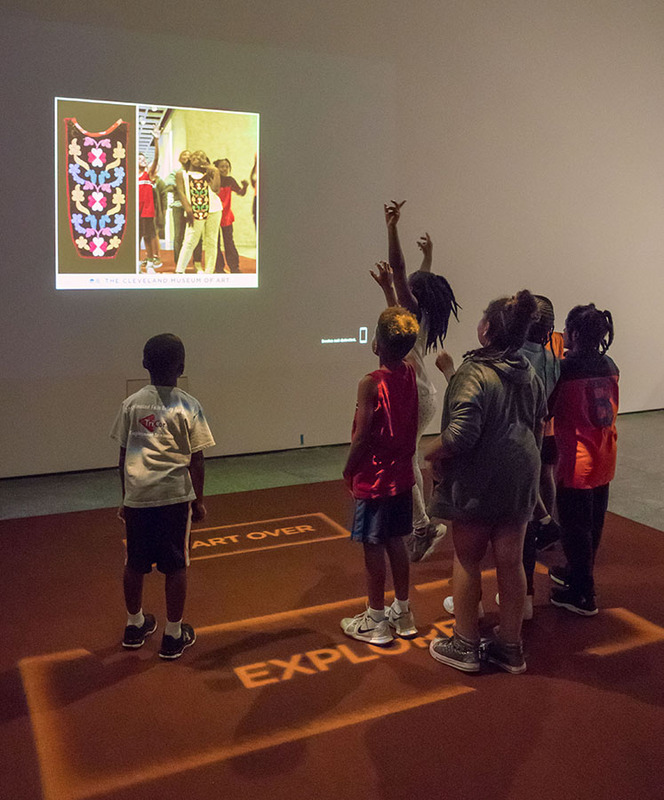 ARTLENS Gallery bridges the gap between visitors and art in a transformative experience, empowering people to learn through play and to build lasting relationships with CMA’s world-renowned collection. Visitors can take the toolsets they develop in ARTLENS Gallery, and apply them to works of art anywhere, even beyond CMA. 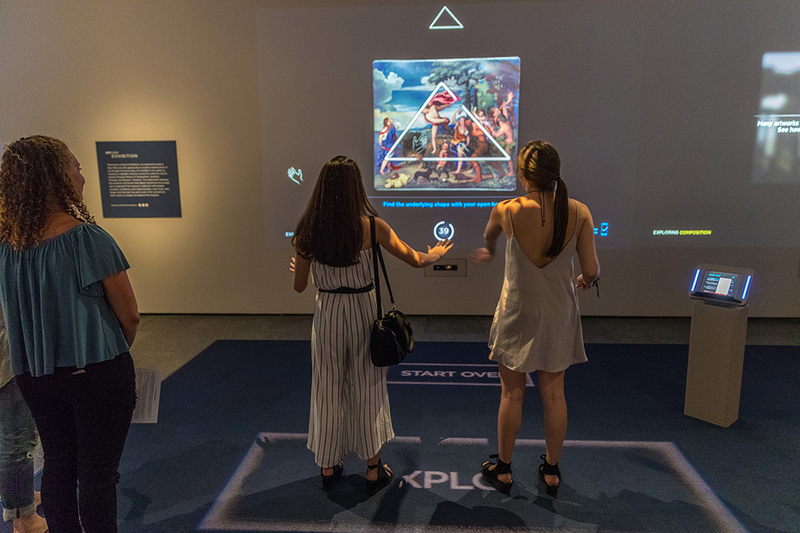 The CMA never uses technology for technology’s sake and will continue to create innovative, immersive experiences that intertwine art and digital innovation. ARTLENS Gallery strives to intentionally integrate narrative and conservation into digital experiences that will continue to highlight objects from across the CMA’s encyclopedic collection. The next rotation of artworks for ArtLens Exhibition is scheduled for Spring of 2019, allowing repeat visitors to experience the space with a new set of master artworks. Additionally, visitors will have the opportunity to experience the artworks currently in ArtLens Exhibition back in their original context. ARTLENS Gallery will continue to provide visitors with the toolsets to feel comfortable looking at art in any context.